Perfectly timed for Fall, I gotta leather jackets on mah nails! Hola! It is me! Wow, holy obvious! Ha! I’ve been busy, it’s true. And while I’ve been busy, stuff just keeps landing on my desk. Today, I dug through Polish Mountain and came out with this cute little set of Essie Minis. What is it? 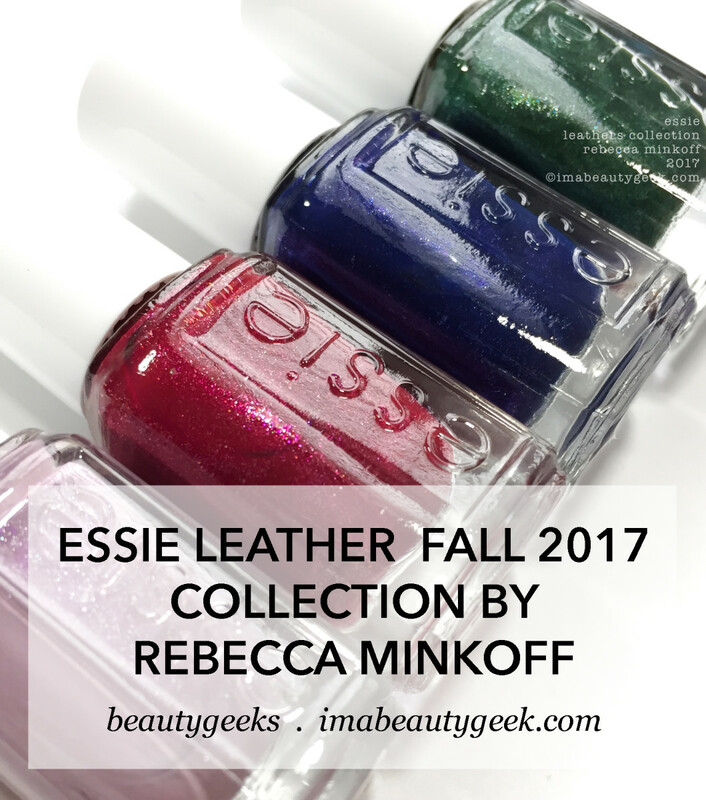 It’s the Essie Leathers Collection by Rebecca Minkoff and it’s a limited edition for Fall 2017. Wanna see swatches? Okay! Oh! I just had The Best Idea! I’ll give you the Essie wordage and then I’ll give you mine! It’s gonna be so fun! Ready? Essie Cross-Body Heat – Leathers Collection 2017 (above). “Your style is on fire. This rosy mauve accented with subtle lavender shine is almost too hot to handle.” OR, hey! Lookit that amazeballz dusty lavender! And there’s little tiny silver fleckies in there that lift the satin-matte and give it that little extra thingy that makes it awesome! 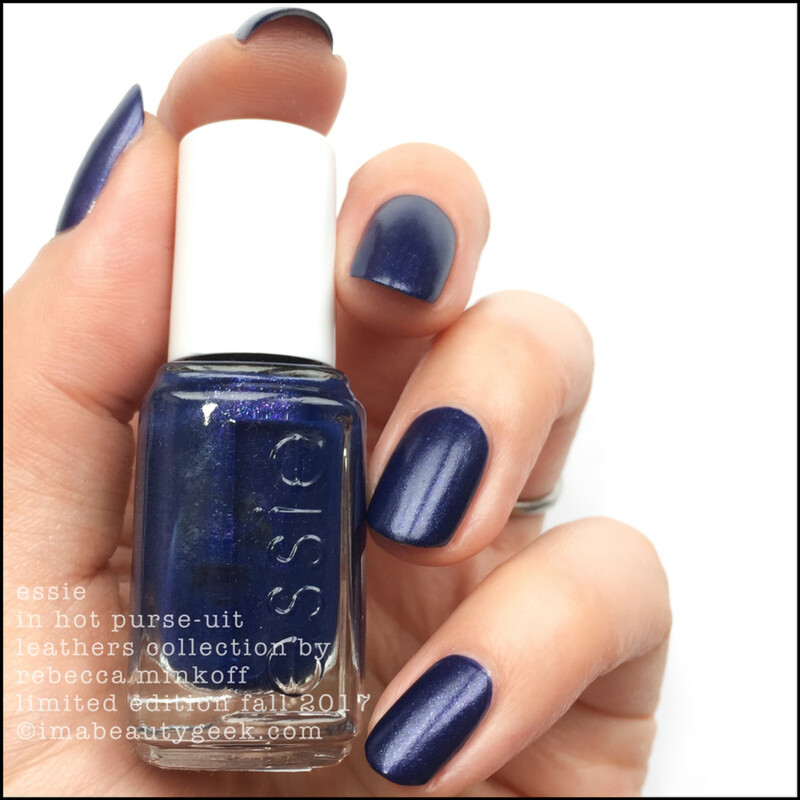 Essie In Hot Purse-uit – Leathers Collection 2017 (above). “Pretty, provocative, this rich indigo blue trimmed with a glowing violet is all about the thrill of the chase.” Like, what? How does that even make sense? I say we roll out the big guns and call it inky blurple. With shimmers. Done. Yes, you can OCW In Hot Purse-uit but I get better saturation and less bald patches if I do 2. My coats are thin though. It all depends on how you load your brush and your preferred method of gettin&apos; the stuff on there. 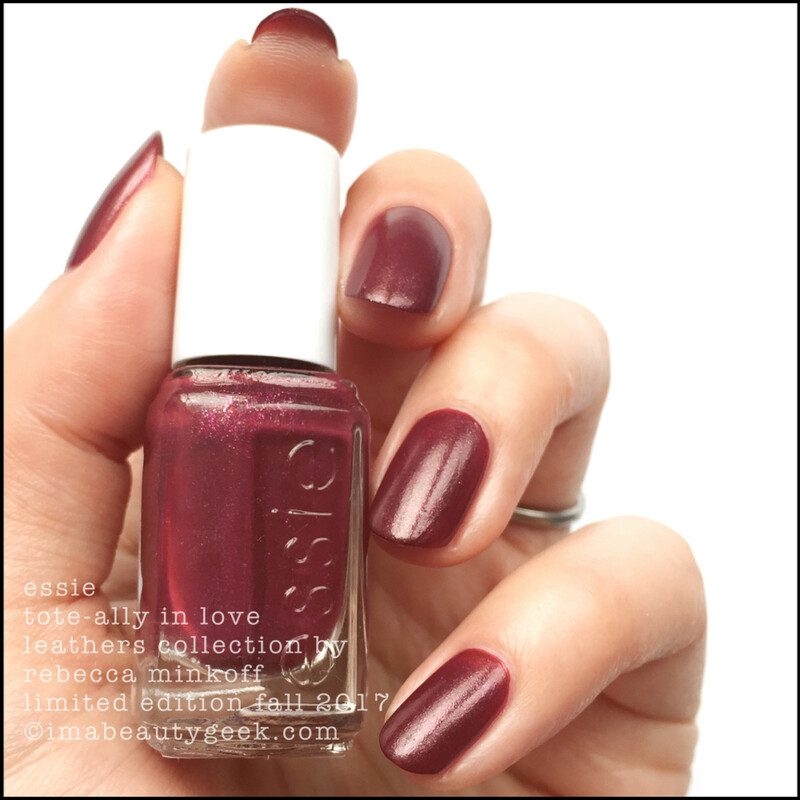 Essie Tote-ally in Love – Leathers Collection 2017 (above). “Romance or obsession? This deep oxblood red with a flash of light crimson totally carries you away.” Okay, this one gives me a little bit of The Lobsters (that just means it makes the colour of my skin look a little more boiled-lobster red than it is) and if you ask me, it’s got a little more berry than oxblood, but hey, I’m just the painter, not the wordsmith. I like it though – for me it’s about the finish. These polishes don’t dry down glassy-smooth; they have a very interesting almost leather-like finish that’s not the same as the mottled leather-like finishes of old. It’s new. It’s lovely. And it’s crazy how much I just want to touch my own nails all day long. 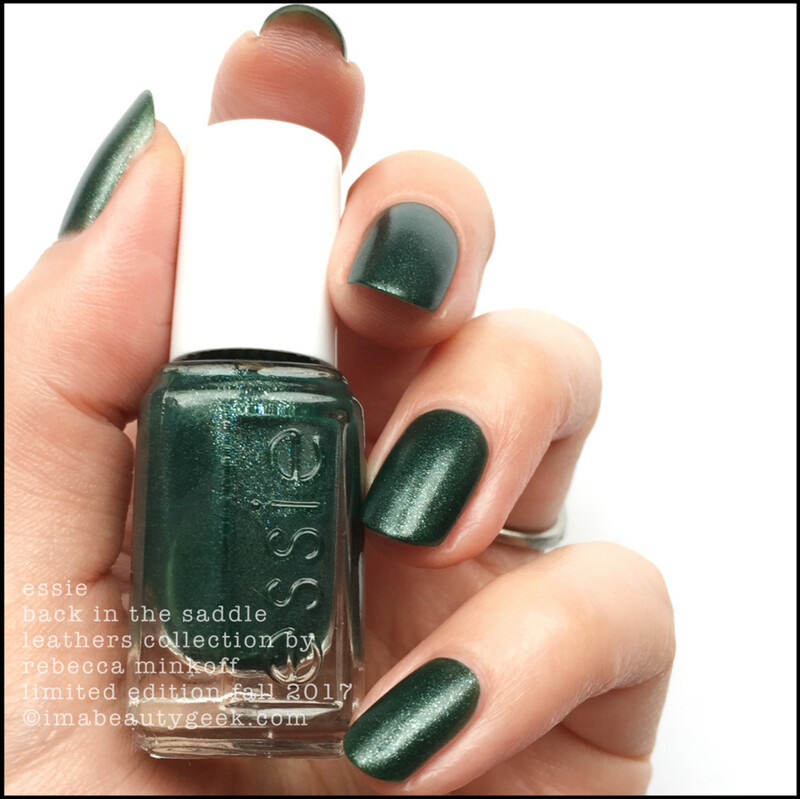 Essie Back in the Saddle – Leathers Collection 2017 (above). “Giddy-up! In this polished dark blue-green cast in silver, you’re in control and riding high.” Yeah, because that totally sums up this polish, right? Hahahaha! It’s evergreen. It’s got them fleckies. It’s my favourite. That is all. And now that I’ve worked so hard to bring you well-rounded shade descriptions, I gotta go. There’s just too much stuff on my desk for me to hang out here all day long. Before I go, you should probably know these all went on like buttah in 2 easy coats. Don’t top ‘em okay? They’re swell straight-up outta the bottle. Let the 1 coat dry and then go again. Oh. 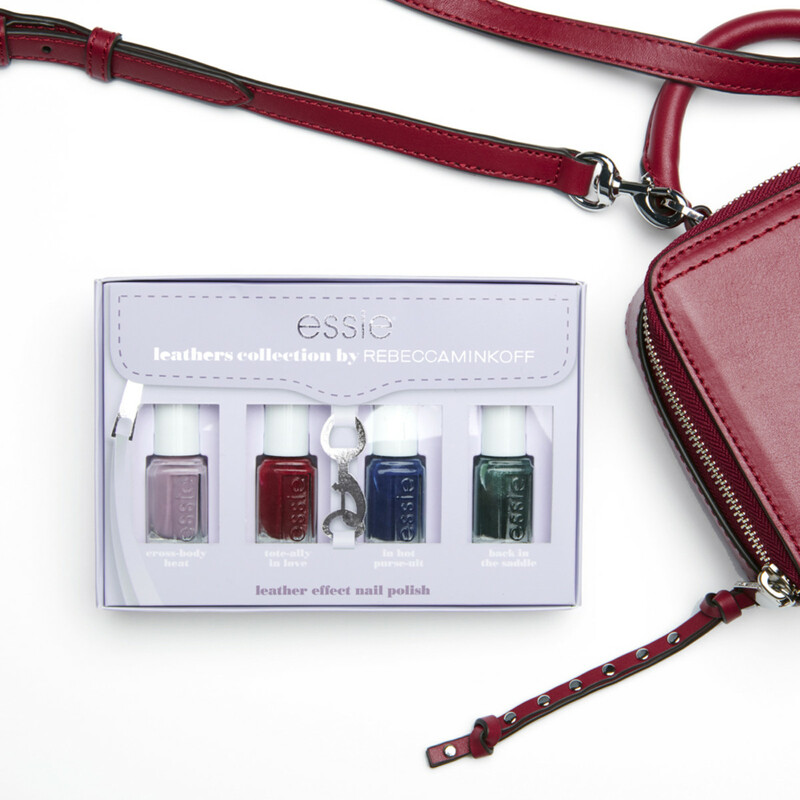 And if you don’t know who Rebecca Minkoff is and how come this leather handbag-themed set of Essie Minis has her name on it, here, have a link. 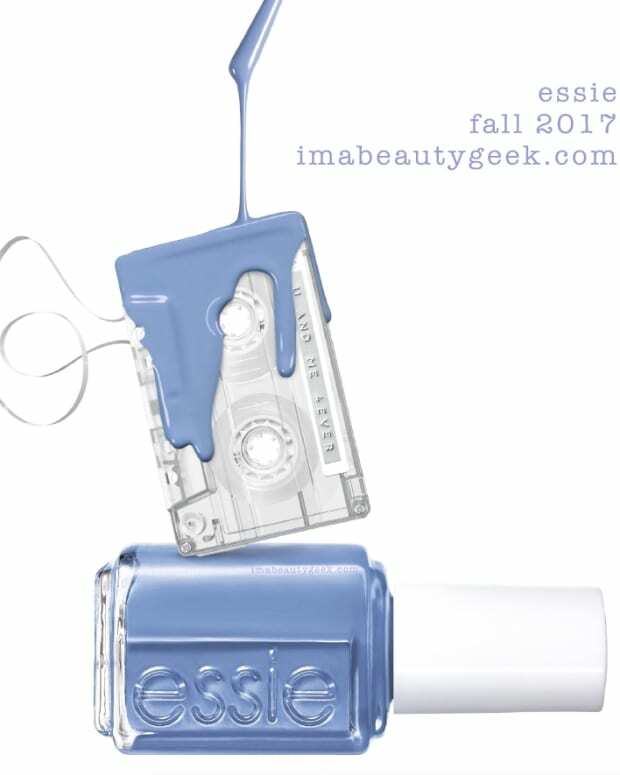 Here in Canada, the Essie Leathers Collection by Rebecca Minkoff is a Fall 2017 limited edition. 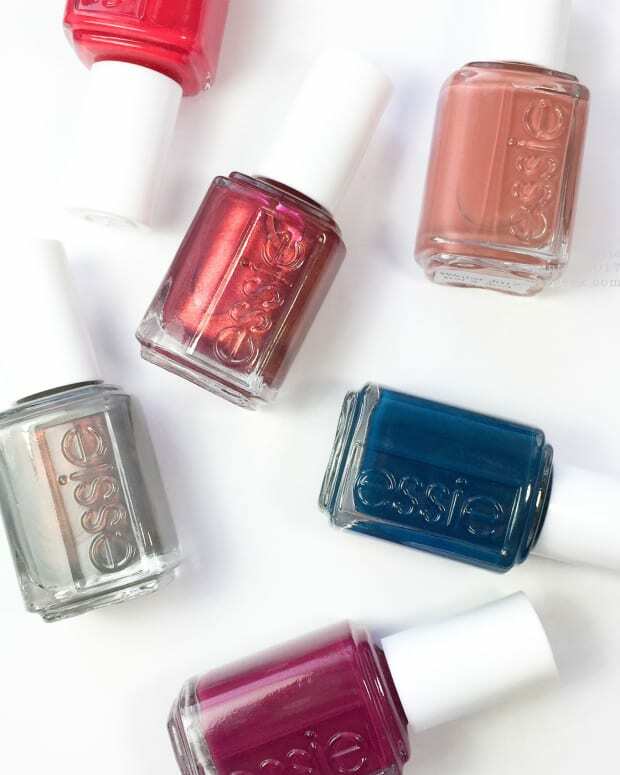 It’s available at Essie-carrying beauty destinations across the nation. 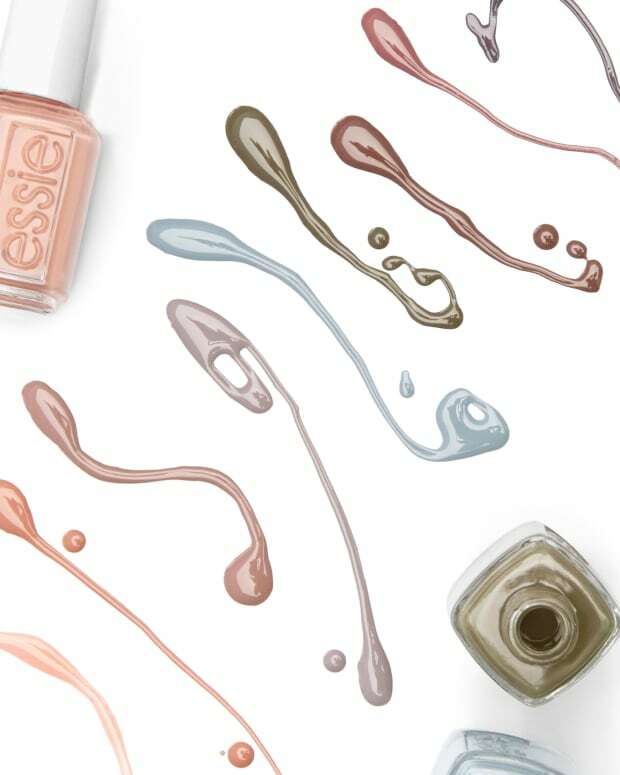 Essie Canada PR tells me it’s gonna run you somewhere around $14CAD. Do I know where it’s available worldwide? Nope. Why? Because Essie is doing different stuffs in different countries. Check in with your local bloggers for more info. Manicures & photos Karen Falcon (she sent Nick out to buy new oven mitts and she’s concerned it could end badly).